Georgia is one of 34 states that has early voting with no specific requirements as to who can vote early. The average number of days prior to an election that voters can cast an early ballot is 21 days in states with a definitive starting date. Early in-person absentee voting is available prior to all elections at the county elections office from 8 a.m. to 5 p.m. on Monday through Friday beginning approximately 21 days before an election. The voting time for special elections will vary. All early in-person absentee voting ends at 5:00 p.m. the Friday before the election. Extended times and additional voting locations are also available throughout Habersham County for some elections. Early in-person absentee voting dates, times, locations and deadlines will be updated prior to each election below. Early in-person absentee voters must fill out and sign an application when they arrive to vote. In order to vote an absentee ballot in person, the voter must provide proper photo identification. All early voting for an Election ends the Friday before that Election. If you have not cast your ballot by that Friday you will need to go to your assigned voting precinct on Election Day to vote. Election Day polls open at 7:00 am and close at 7:00 pm. The deadline for voter registration or registration changes for any Election is approximately 30 days prior to that Election. 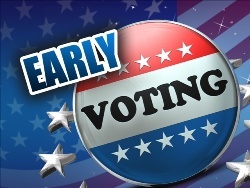 For more information about voting early in Georgia, please visit the Secretary of State’s website http://sos.ga.gov/.